Great American Deli of Ooltewah, Tennessee is recalling 816 Premium Chicken Salad Wheatberry Sandwich Lot Number 17 198 because they have the wrong ingredient statement and contain undeclared eggs and soy. Great American Deli of Ooltewah, Tennessee is recalling 816 Premium Chicken Salad Wheatberry Sandwich Lot Number 17 198 because they have the wrong ingredient statement and contain undeclared eggs and soy. People who have an allergy or severe sensitivity to eggs or soy run the risk of serious or life-threatening allergic reaction if they consume these products. Product was distributed in Michigan, Kentucky, Tennessee and Georgia to convenience stores and vending machines. 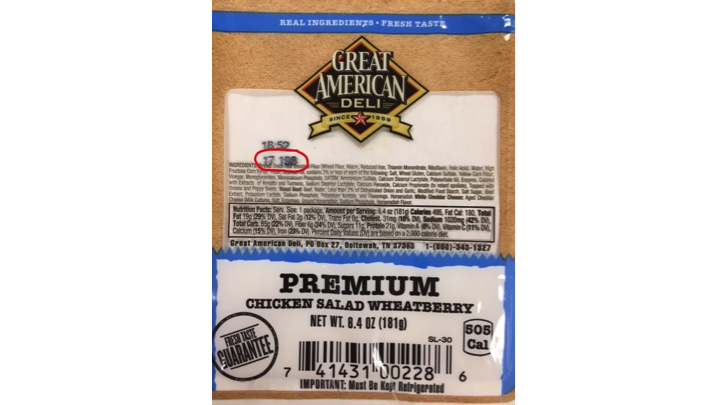 The affected product weighs 6.4 ounces and is packaged in plastic containers labelled: Great American Deli Premium Chicken Salad Wheatberry – Lot Number 17 198 (which is located on the top left front of each package). The recall was initiated after Quality Assurance discovered that product containing the allergens was distributed in packaging that did not reveal the presence of the allergen. The ingredient statement on the affected product is for a different sandwich. Consumers who have purchased the affected sandwiches are urged to return them to the place of purchase for a full refund. Consumers with questions may contact the company at 1-800-343-1327 Monday – Friday 8:00 AM ET to 5:00 PM ET.